Every season since the state playoffs began in 1969, the Sunflower League has sent a team to the state championship game in the state’s largest classification. This season will be no different as Olathe North and Shawnee Mission East will square off for the right to play in the 6A state championship game in Topeka next weekend. The Olathe North Eagles have been that state championship game representative ten times since 1996, including eight state titles. North last won the 6A title in 2009; blowing out Wichita Heights 37-3. The Eagles lost the title game to those same Falcons a year later. Shawnee Mission East is looking for its first appearance ever in a football championship game. The Lancers have enjoyed a school-record ten wins this season, but it hasn’t come easy. Needless to say, the Lancers have had a flare for the dramatic under first-year coach Dustin Delaney. SM East topped Olathe Northwest 27-22 back in Week 3 on a 36-yard, tipped Hail Mary pass from Christian Blessen to Alec Dean. A week later, East got a late touchdown to top tonight’s opponent Olathe North 23-22. The Lancers followed that up with an overtime win over Shawnee Mission South (27-21) and their lone loss of the season, 17-10 to Lawrence Free State in overtime. Since then, only last week’s 20-13 quarterfinal win over Olathe East has been played within three touchdowns. The Lancers are led by Luke Taylor who has rushed for 1,145 yards and 11 touchdowns. But it seems a different player steps up each game. Ryan Carter rushed for a team-high 82 yards and a touchdown in the win over Olathe East. Gunnar Englund has filled in at quarterback the past two games for the injured Christian Blessen. Englund threw two touchdown passes last week. As mentioned earlier, Olathe North lost to these Lancers 23-22 on a late touchdown back in Week 4. In that game, East rushed for 215 yards, while holding Olathe North’s duo of Venus Triplett and quarterback Cole Murphy to a combined 132 yards rushing. Triplett has rushed for 1,403 yards and 22 touchdowns on the season, but was held to just 35 yards rushing in the win over Free State last week. In fact, Free State outgained the Eagles by more than 175 yards in total offense, but the North defense forced six turnovers to win the game. 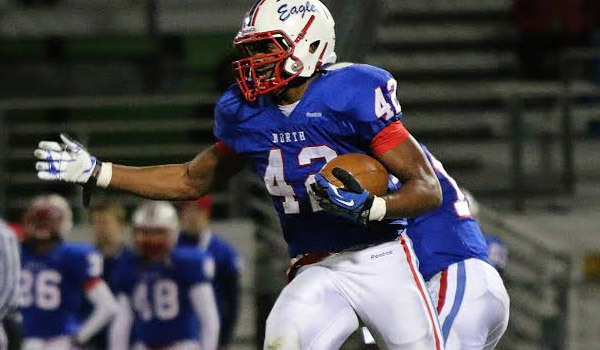 That Olathe North defense has led the Eagles this far by only giving up 21 total points in their three playoff wins. Garden City, arguably the biggest surprise left in the playoffs, won a thriller, 35-28, against Wichita Heights last week after a 40-36 victory against Wichita Northwest in the first round. Derby has continued to roll through its season after a Week 1 loss to Salina South. The Panthers have won their two playoff games by a combined score of 111-27. Garden City has 27 seniors, including 17 starters, while Derby has 33 upperclassmen, including 20 starters. The Buffs started 4-3 – just like its 1999 state title team – and have won four in a row, including the WAC championship. Quarterback Greyson Tempel has 2,442 passing yards, 1,271 rushing yards and 44 TDs accounted for. His brother, Dustin, paces the Buffs with 55 catches for 909 yards and nine scores. Caleb Tramp is the team’s leading receiver with 52 catches for 1,073 yards and 11 scores. Derby has allowed just 47 points through three quarters and 34 in the first half this season. The Panthers have a bevy of Division I prospects, including running back Tyler West and tight end DeAndre Goolsby and a solid quarterback in Jeremy Dunham. Derby has outscored opponents 49-12, while Garden City has a 36-23 edge. The Panthers stand No. 1 in the classification in scoring offense and defense. The last meeting between the two squads was a 35-28 Garden City win in 2007. Garden City is in the semifinals for the first time since 2005 and have won state crown, in 1999. Derby, Class 6A’s top-ranked squad nearly all season, has just one state crown in 1994. Derby is 0-5 in its last five semifinal games (all since 2004), but breaks through and reaches the title for the first time since 2002.